Egypt, the daddy wars, and J. Lo in Turkmenistan: The week’s most interesting Slate stories. 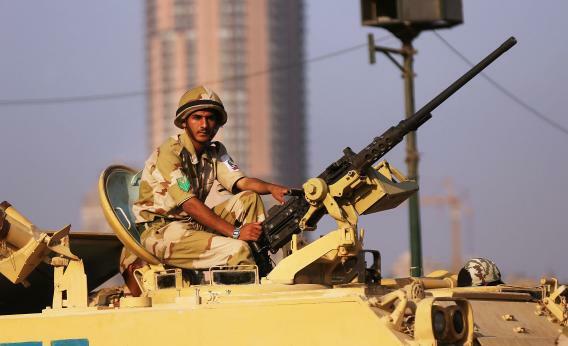 Members of the Egyptian military man an armored vehicle as they guard a bridge near Tahrir Square on July 8, 2013. “Is Egypt’s Revolution Over? : It was always going to be hard. Now the window for democracy is closing fast,” by William J. Dobson. Egypt’s “young democratic system” may not be able to withstand a battle of wills between the military and the Muslim Brotherhood. And as Tahrir Square devolves into a site for “hollering grievances against whoever is in charge” rather than the grounds of a great revolution, hope for democracy is dwindling. Elsewhere in Slate, Anne Applebaum takes a look at what ties recent uprisings in Egypt, Brazil, and Turkey together. “Forget and Forgive: Eliot Spitzer wants New Yorkers to give him the one thing he has never shown anyone else: forgiveness,” by John Dickerson. Eliot Spitzer announced his bid for New York City comptroller last Sunday, asking constituents to forgive and forget the transgression that lost him the governor’s mansion back in 2008. Dickerson points out the irony that mars Spitzer’s call for forgiveness—his reputation was “built on ruthlessness,” particularly when he held the post of New York attorney general. If he hopes to become comptroller, “The Sheriff of Wall Street” must hope the public is feeling generous enough to extend him a courtesy that he never extended his opponents. “Who Has an Abortion After 20 Weeks? : That’s right when my patients find out about devastating fetal defects,” by Darshak Sanghavi. A Texas bill that prohibits abortions after 20 weeks was passed earlier this week at the Texas House of Representatives.Sanghavi explains that most “comprehensive” scans take place just before the 20-week mark and can uncover major birth defects that are difficult to detect before then. With this new bill in place, Texas women may be forced to rely on subpar information to make a life-defining choice. “I’m Not a Hero for Taking Care of My Kids: I’m also not baby-sitting them. I’m their dad,” by Peter Mountford. What is life as a stay-at-home dad like? Pretty heroic, according to the passers-by who praise Mountford when they see him with his kids. Mountford adds an important perspective to the conversation about parents, the workplace, and the home with this reflection on life as a stay-at-home father. “Patients Need Poetry: And so do doctors,” by Danielle Ofri. Although poetry and medicine might appear to have little to learn from each other, Ofri examines how the world of medicine is starting to embrace its literary side. She explains the way in which writing and reading poetry can help caregivers maintain their empathy and patients retain their voice. “Andy and Jamie: How Andy Murray’s obsession with beating his older brother helped him become a Wimbledon champion,” by Hugh MacDonald. As Britain celebrates its first men’s Wimbledon champion in 77 years, MacDonald sheds light on the sibling rivalry that pushed Murray to greatness. Andy and his older brother Jamie lived their childhood in a perpetual state of competition, an environment that drove Murray to be one of the best players in the world. Also in Slate, Josh Levin, Mike Pesca, and guest Johnette Howard discuss Murray’s Wimbledon win and more sports news in this week’s episode of Hang Up and Listen. “Embarrassment of Riches: What happens when the rich and famous rent themselves out to the very, very rich and much less famous,” by Katy Waldman. Last month, Jennifer Lopez was criticizedfor taking $1 million for the job of serenading Turkmenistan’s dictator-president. Waldman lifts the curtain on this mysterious sector of the economy, in which the incredibly rich (and sometimes, the incredibly despotic) hire Hollywood stars to glitz up their guest lists. Waldman explains that the payoff for stars is tremendous, and even if you’re caught clinking champagne with a terrible person, people forget quickly enough for you to do it all over again. “Tipping Is an Abomination: Here’s how to get rid of it,” by Brian Palmer. Tipping is a terrible way to pay workers, Palmer argues, because it’s not indicative of quality of service, it allows employers to get away with not paying their workers a living wage, and it makes the customer the co-employer. As Palmer notes, “virtually every other employee in America knows how much they’ll be paid up front,” and they manage to complete their work satisfactorily. Tipping doesn’t improve service, it cheats workers, and it needs to be stopped.